During the holidays, the hype and family togetherness can sometimes be just a little overwhelming. It seems that it’s all about the kids, and the presents, and the singing, and the egg nog. Instead of drowning in that last one to escape, there is another remedy for someone seeking something that’s just a little less saccharine – The Santaland Diaries. What started in 1992 as a NPR holiday tradition that catapulted memoirist David Sedaris to international fame, has reached the TheatreWorks stage in their “alternate” holiday production this year. Joe Mantello adapted Sedaris’ essay into a full one-act, one-man play in 1996, and it has enjoyed seasonal success in regional, college, and in some cases even high school theatre ever since. In short, this little gem details Sedaris’ experiences as Crumpet the elf, navigating the treacherous landscape of Macy’s in Manhattan during the holiday season. 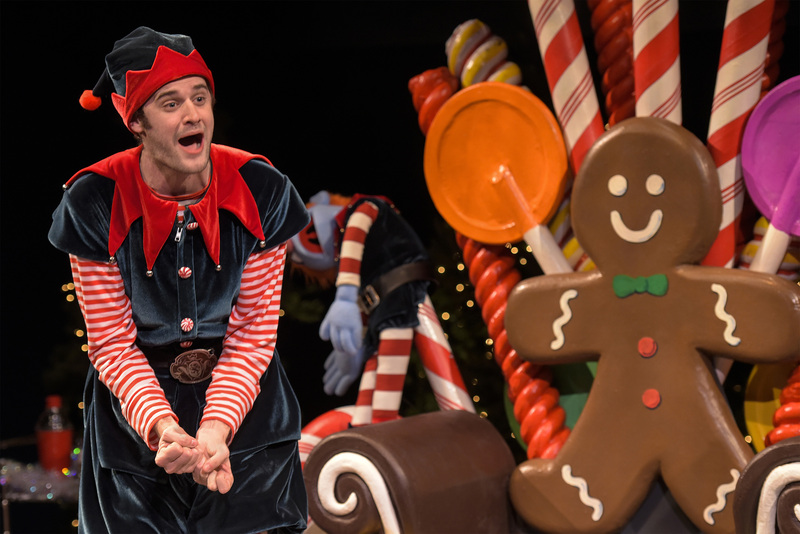 The play runs just 70 minutes without an intermission, and while it’s not appropriate for the youngsters who still believe in Santa, it will have their parents at least chuckling if not fully guffawing at poor David’s predicament as a misplaced and somewhat “low key” elf. Jeffrey Lo directs Max Tachis in this TheatreWorks production at the Lohman Theatre on the Foothill College campus. 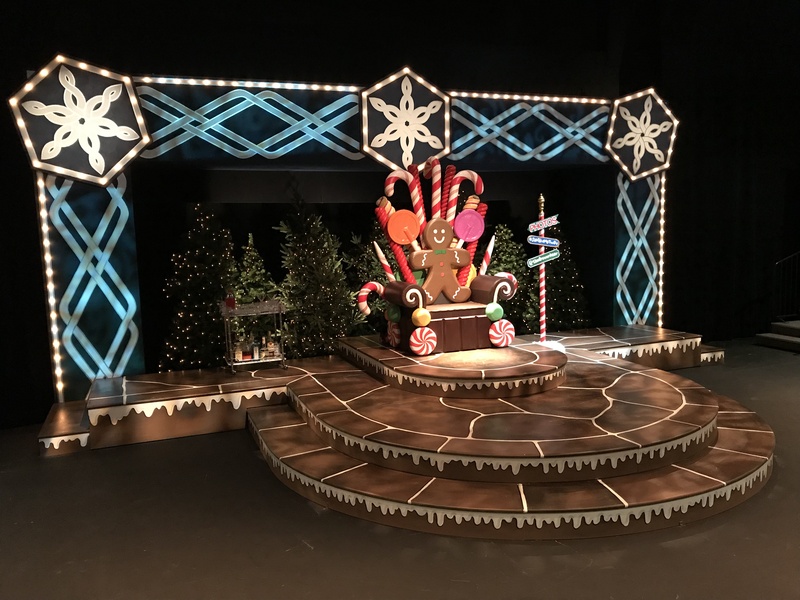 Scenic designer, Christopher Fitzer captures the feel of the Macy’s Santaland setup with a nicely framed Santa throne in front of a small, but tastefully lighted pine forest. There’s no snow, except when momentarily provided by Mia Kumamoto’s lighting design toward the end of the piece. Tachis is wonderful in this show. It’s not an easy task to be an engaging solo performer for an unbroken 70 minute stretch, but Tachis is up to the challenge. Before he enters the stage, the set stands open for patrons to take turns sitting in the big chair and taking pictures. Yours truly decided to take that opportunity to shoot the accompanying shot of the colorful set, signpost (next to the big chair) and all. When Tachis first enters, he hams it up posing with the signpost for a few last photos before he instructs patrons to put their phones away for the duration of the performance. His curtain speech is a bit different than the standard recordings. It both does the job and sets the tone for much of what is to come. Howard Ho’s sound design could almost be considered “counter-Christmas” with some rock, some eerie haunted-sounding holiday arrangements, and a bit of burlesque thrown in at just the right moment. 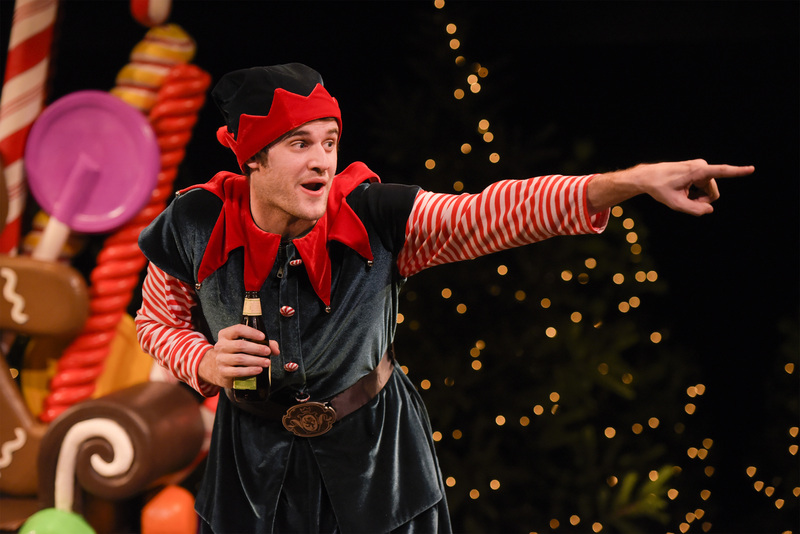 In addition, as Tachis portrays David / Crumpet the elf introducing the audience to the different regions of Santaland, sudden horn blasts accompany the unfurling of the appropriate banners, sounding like attacks to the poor elf on stage. Tachis, for his part, starts out as himself. Once he takes care of the pre-show business and delivers his unique announcement, he reemerges as David Sedaris, job hunter in NYC during the holiday season. As David, he recounts to the audience a conversation he had with his roommate sneering at the ads for seasonal help. He then shares that he applied to become a store elf on a whim after this discussion. Despite his having shared in some mockery with his roommate over such a position, he’s unemployed and down to his last $300 before he’d have to resort to becoming a dog walker to be able to eat and figures how hard could it be? Little did he know. Tachis’ easy manner, sardonic delivery, and facial expressions convey volumes. 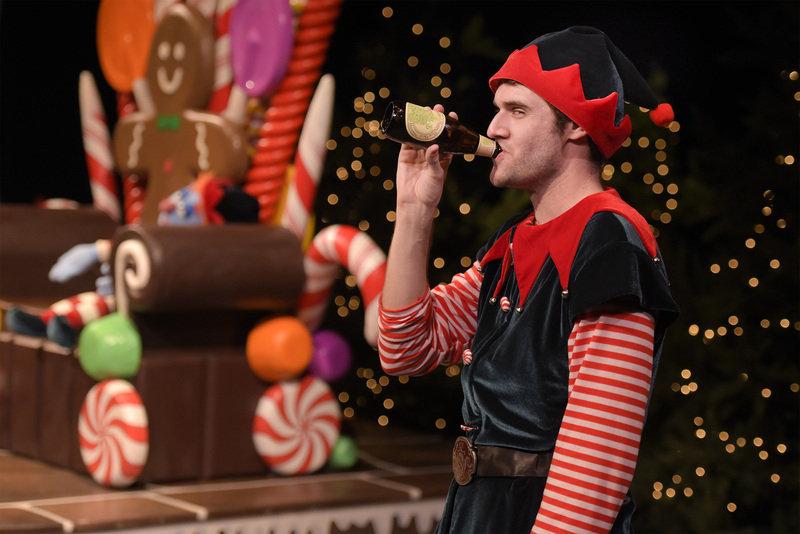 Through his monologue, we come to understand that in many ways, becoming a store elf is much like any other job. The duties, however, are a bit specialized. As he recounts the interview, onboarding, and training phases, he clearly points out the unique aspects of his position. It’s evident that David really doesn’t belong in this job, but he’s going to make it work somehow. Then David gets to the final training session when his work uniform is required. He changes on stage with appropriate snide comments about his elven wear, and a chorus of “Santa Baby” plays on as he applies the velvet costume pieces. Costume designer Jill C. Bowers hits the perfect combination of colors and textures to make his outfit memorable and authentic. Much of what Tachis relays sounds extremely familiar to anyone who has worked in the service industry dealing with the general public up close and personal. Whether it’s the impatient or insipid customers, or his zany colleagues, audience members can picture the people he describes and, in many cases, correlate them to acquaintances from their past. The standout scenes though are when Tachis brings out his alter ego, designed by Mark Stys. His mini-me elf puppet is adorable, and the interactions Tachis has with him are priceless. Whole conversations ensue, some involving members of the audience, some further upstage, but all with wonderful expressions and mannerisms. Tachis is quite an adept puppeteer for this production, seamlessly manipulating the mini-elf and frequently exchanging glances as they “share” the jokes together. Being live theatre, there are moments where slight malfunctions might occur, and on opening night did occur at least once. At one critical moment, a set piece didn’t entirely cooperate when it was deployed, but Tachis adroitly delivered a situational ad-lib and didn’t miss a step. He has internalized this material to the point where it flows easily and naturally, no matter what happens. This production won’t appeal to everyone, but if you’re looking for a fun escape from the normal holiday happiness, this is definitely the show for you. It’s a little edgy, but not overly so. It’s a got a wee bit of off-color language and content, but there too, not excessively so. It gives audiences an entertaining appreciation for a seasonal job that they’ve certainly at least seen if not lived themselves. It’s clever, and the time flies by before sending folks back to their normal holiday hubbub. 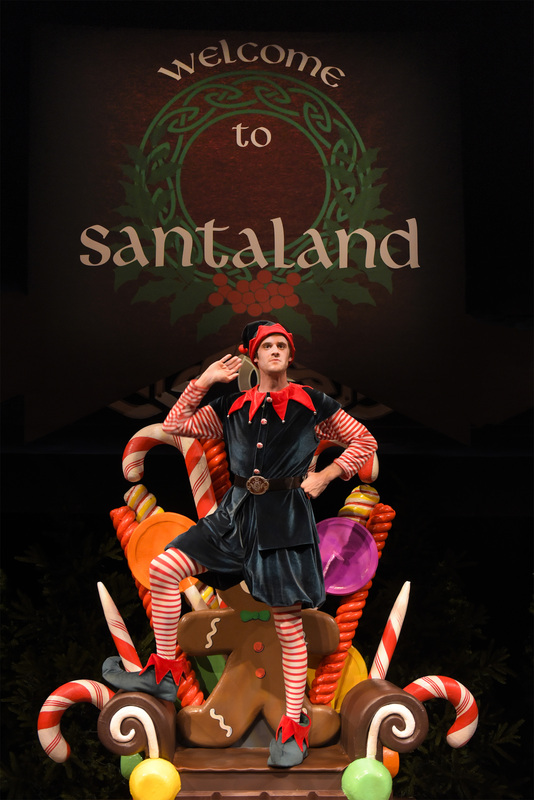 See http://theatreworks.org/201718-season/201718-season/santaland-diaries/, email boxoffice@theatreworks.org, or call (650)463-1960 for more information or to order tickets.